Napoleon Bonaparte said that an Army travels on its stomach. As most military rations are barely discernible as food, the addition of the gum provided a highly desirable element of flavor. An army marches on its stomach. Since man first went to war, he needed logistical support to fight. At the top of that logistical list was food, or at the very least something with calories that the human body could digest. 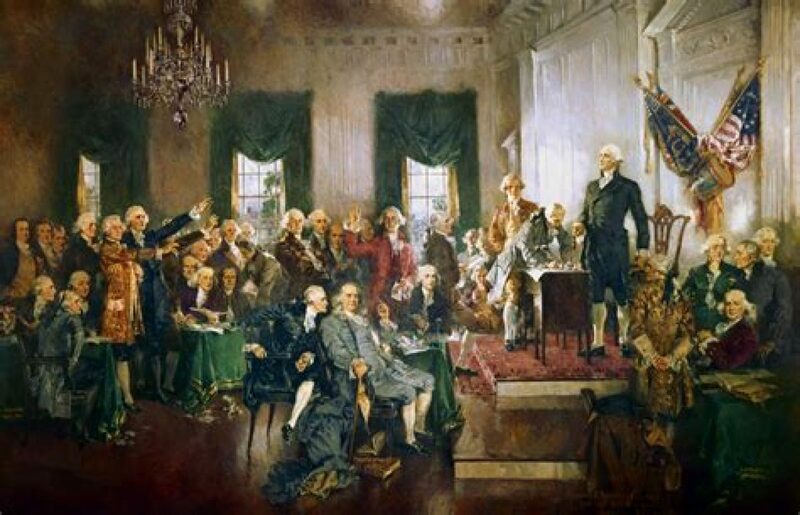 The logistics of war have nearly ruined campaigns and empires, for even into the twentieth century supplying an army proved just as difficult as raising one. By the outbreak of World War II, the United States, at least, managed to properly supply and feed its soldiers regularly. To make sure the troops got fed no matter where they were deployed, the US military developed a system of rations based on where the soldiers were sent and how close they were to rear support. A-rations were eaten straight from a field or garrison kitchen. Consequently, they were the rations most likely to taste like actual food. B-rations were the next best thing, being preserved kitchen rations meant to last a short time. 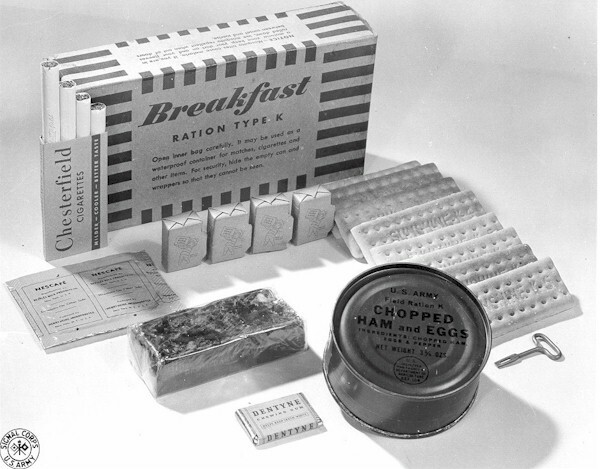 C-rations were canned, complete meals –the forerunner to the much-maligned but functional Meals, Ready to Eat. D-rations were essentially a chocolate bar meant for emergencies. In between the C and D were the K-rations. 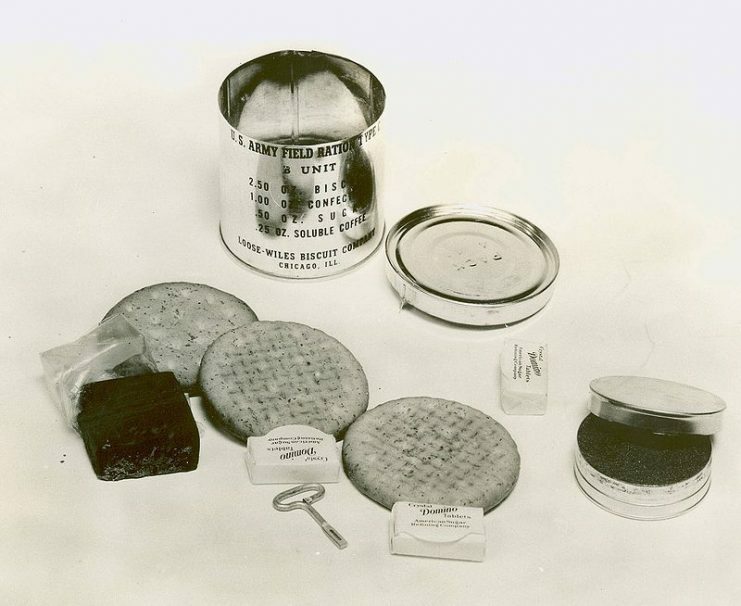 A selection of United States military C-Ration cans from World War II with items displayed. Note that the Old Gold cigarettes and vanilla caramels were not part of the C-ration. 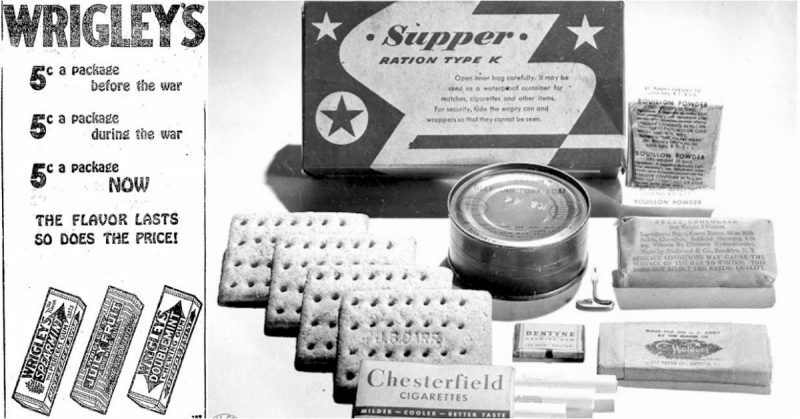 K-rations were originally designed for light infantry and paratroopers, intended to keep them fed until the rest of the army caught up with their spearhead. 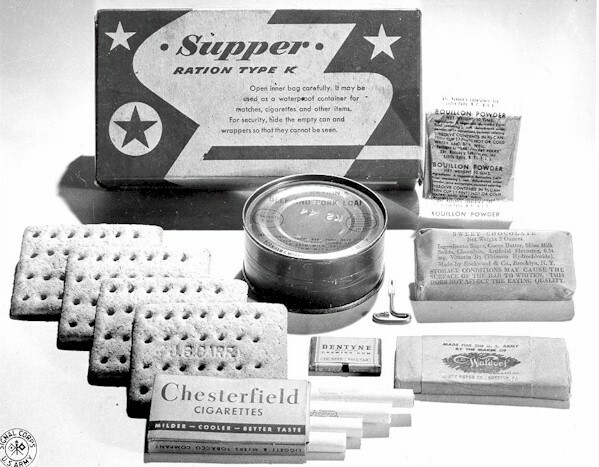 The K-ration experienced several modifications during World War II, but several mainstays were packed in them from start to finish. Designed for breakfast, dinner, and supper (now more commonly known as breakfast, lunch, and dinner), the basics of the packs remained consistent from meal to meal, with minor changes. The breakfast ration contained coffee, biscuits, a fruit bar, three sugar tablets, and a can of something legally identifiable as meat. The lunch ration pack replaced the coffee with bouillon paste and a different type of technically meat. 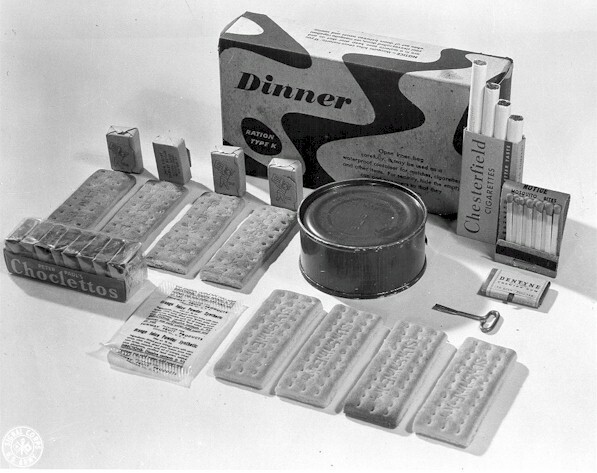 The dinner pack, like the others, contained biscuits, meat in can form, and also several cigarettes and some matches. Each K-ration contained around 3,000 calories. Units operating in extreme climates noted the need for a higher calorie pack. These packs were first developed in 1942, and, despite criticisms, they would see action throughout the remainder of the war. One thing about the packs remained consistent: each K-ration pack, regardless of the meal, contained two pieces of chewing gum. The gum was included for several reasons. Chewing gum releases saliva, helping to keep the mouth clean for soldiers who might not have time to brush their teeth twice a day as instructed by a dentist. Chewing gum also releases tension, one reason why cigarettes were included as well. 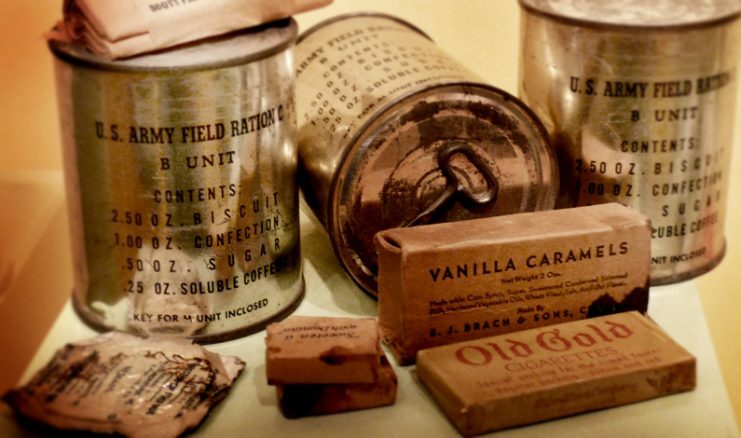 Four flavors were used for the various ration packs: spearmint, peppermint, wintergreen, and cinnamon. These widely available flavors from a variety of brands were packed into K-rations and other ration packs as well. Beeman’s, Dentyne, and Wrigley’s gum were packed into K-rations throughout the war. The gum came in both tablet and stick form, depending on the brand and flavor. As most military rations are barely discernible as food, the addition of the gum provided a highly desirable element of flavor. Able to keep their mouths relatively clean and to keep calm under pressure, K-rations served the soldiers well even if they didn’t taste very good. 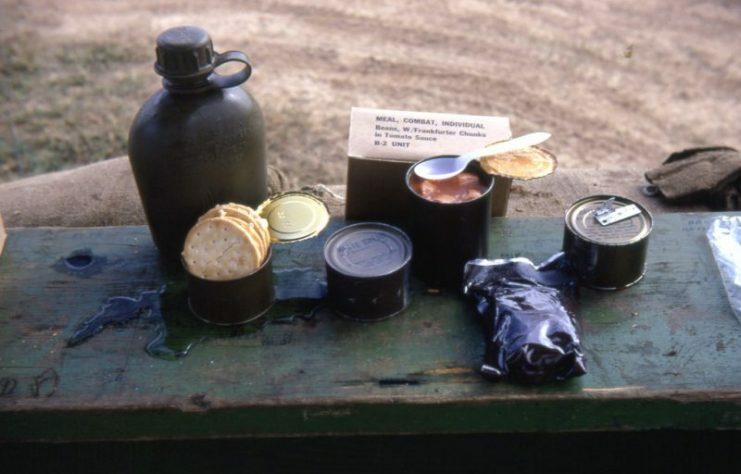 A United States Airman’s Meal, Combat, Individual ration (also called a C-Ration). DaNang, Vietnam, circa 1966–1967. The canteen was not part of the ration. Note the foil wrapped accessory pack. Though no substitute for home cooking, the rations kept the men fed, and that meant they could keep fighting. It took time for the United States to build up its logistics fully, but when it did, it made sure the men and women in uniform were properly and fully equipped to go to war. Even if the meat was worse than Spam.